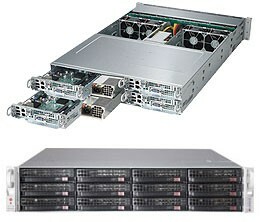 The Supermicro 6028TR-HTR SuperServer is a high-end server based on the SC827HQ-R1K68B 2U rackmount chassis and the dual processor X10DRT-H/HIBF serverboard. 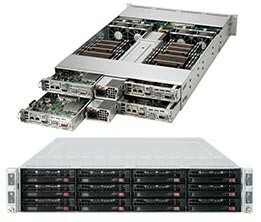 The Supermicro 6029TP-HC0R SuperServer is a 2U Rackmount server with 3 3.5" Hot-swap SAS/SATA Drive Bays, flexible networking support and up to 2200W Redundant PSU. The Supermicro 6029TP-HTR SuperServer is a 2U Rackmount server with 3 3.5" Hot-swap SATA3 Drive Bays, flexible networking support and up to 2200W Redundant PSU. The Supermicro 2029TP-HC1R SuperServer is a 2U Rackmount server with 6 2.5" Hot-swap SAS/SATA Drive Bays, flexible networking support and up to 2200W Redundant PSU. The Supermicro 2029TP-HC0R SuperServer is a 2U Rackmount server with 6 2.5" Hot-swap SAS/SATA Drive Bays, flexible networking support and up to 2200W Redundant PSU. The Supermicro 2029TP-HTR SuperServer is a 2U Rackmount server with 6 2.5" Hot-swap SATA3 Drive Bays, flexible networking support and up to 2200W Redundant PSU. The Supermicro 2028TR-HTR is a Dual Intel Xeon E5-2600 v3 Series 2U Rack Server with Redundant Power Supply, and 24x High-Capacity 2.5" Hot-Swap Bays. The Supermicro 6028TP-HTR is a 2U TwinPro2 Rack Server with Redundant Power Supply, and 12x High-Capacity 3.5" SATA Hot-Swap Bays. 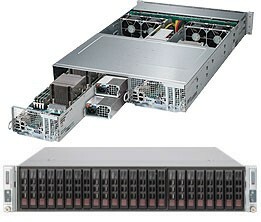 The Supermicro 2028TP-HTR is a 2U TwinPro2 Rack Server with Redundant Power Supply, and 24x High-Capacity 2.5" SATA Hot-Swap Bays. The Supermicro 2028TP-DTR is a Dual Intel Xeon E5-2600 v3 Series 2U Rack Server with Redundant Power Supply, and 16x High-Capacity 2.5" SATA Hot-Swap Bays. 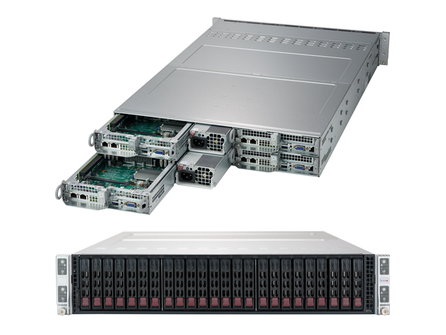 The Supermicro 2028TP-DNCR is a 2U TwinPro Rack Server with Redundant Power Supply, and 24x High-Capacity 2.5" SATA / SAS / NVMe Hot-Swap Bays. The Supermicro 2028TR-H72R is a 2U Rack Server with Redundant Power Supply, 24x High-Capacity 2.5" Hot-Swap Bays, and Integrated 6G SAS.